When you want uninterrupted power supply for home, work or play during power outages, a portable generator comes handy. A portable generator can keep the lights on and power several other appliances depending upon the size. There are a variety of models available with different capacities that range from less than 1000 watts to over 15,000 watts. Many people choose portable generators over the standby version as they are more cost-effective; however, there are several factors to consider. In this article we will tell you about the key factors to consider when choosing a portable generator. In general, portable generators are capable of delivering good quality power; however, there are some off-brand models that use inadequately sized motors or low-tech speed governors. Some manufacturers use cheap components to save production cost. So, make sure you rely only on reputed brands and buy from trusted manufacturers. Running low quality generators can damage your appliances. Portable generators are regularly used throughout the day. It is not uncommon for a generator in a job site to be started early in the morning and kept running the entire day. If you are camping outdoors, running a small refrigerator will also require the generator to run all day and night. Thus, you need to look for a model that comes with safety features. 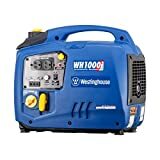 The Westinghouse WH1000i, for example, comes with a low-oil shut down feature. This means when the level of oil drops to a level that might harm the engine, the generator will automatically shut down to prevent any damage. Another safety feature to keep in mind is to ensure that the generator comes with an sufficiently sized engine. When a generator runs in its optimum capacity, an engine that is not adequate enough will not be able to take the load. A good quality generator will house an engine that has sufficient margin to sustain the continuous load rating. Whether you want to use a portable generator at home or on the job site, make sure you choose a model that can supply enough power to meet your needs and prevent accidental overloading. We would suggest that you calculate the total load required in watts and then add the highest surge load to get an estimated total. An extremely important factor to consider when choosing a portable generator is the fuel type. The main hazard is carbon monoxide poisoning so the fuel source you use makes a big difference in determining the safety level. Based on fuel type, there are four different types of portable generators – diesel-powered, gas-powered, propane- powered, and electricity-powered. The biggest advantage of using a diesel engine is that it can extract more energy per gallon. Gas-powered engines tend to be small and less-efficient; however, they are comparatively easier to start in the event of an emergency. The benefit of propane-powered generators is that they can burn fuel in a clean manner. 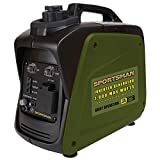 Electric portable generators are called so because they use batteries to start; however, they burn fuel (usually gasoline) to produce electricity similar to manual-start generators. Apart from the factors mentioned above, there are a few other things that you need to consider when choosing a portable generator. Look for a model that delivers a long run-time at 50% load. When the generator has a longer run time, you will not need to refuel it as often. You must also make sure that you choose a generator with enough and suitable type of outlets for the appliances you want to run. For example, if you want to power a window air conditioner or heating system, you may need to choose a generator with a 30 amp outlet. We hope this information helps you with choosing a portable generator that’s perfectly suited to your needs. I was thinking about getting a backup generator for our home as it would be useful in the instance of a blackout. The part where you mentioned that they use different kinds of fuel and that the propane-powered ones are the ones who burn fuel in a clean manner is simply helpful to learn. That is due to the fact that your article just helped me decide that I would like to go for a propane-powered generator. It should help me get my electricity when needed while keeping mother nature happy. Thanks! Good choice to get a portable generators. In the winter months , you definitely want to have heat when the power is down. Your advice to find a portable generator that has an adequately sized motor so it can provide quality power is a good idea. In order to find one, you’d probably want to research the various manufacturers and models online. 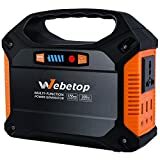 This could help you get feedback on how well they worked and how long they lasted so you can figure out which generator is best for how you plan to use it.